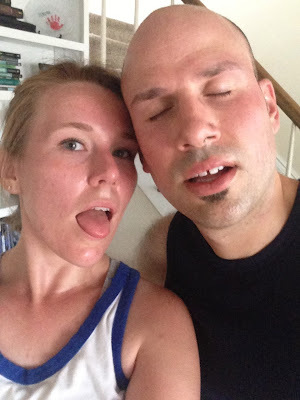 This is us after our very first workout with Shaun T's FOCUS T25 DVD Workout . I asked for it for an early birthday gift with the condition that we would do the entire 10 weeks together, and Adam agreed. We're on week 9 and haven't missed one day! His commitment to not only the tough workouts, but to ME absolutely means the world to me! As crazy as it sounds, the 25 minutes we sweat together each morning is one of my favorite parts of the day. Both of us have noticed big changes in our bodies including more cardio stamina. That's why a couple Sunday nights ago, I felt a strange urge to go running. I say "strange" because I am by no means a runner. I forced myself to train for a church 5K a couple years ago, and was able to finish by a combo of jogging & fast walking. I pushed myself harder than I ever have in my entire life and was able to run for 15 minutes straight without stopping. Now, I know that may seem silly to some of you runners, but for me this was HUGE! Even in high school, I could barely make it 1/2 way around the track before walking during our PE runs. It was exciting to see all of the hard work from the last 2 months really pay off. It makes me want to continue working hard to become even stronger! I'm thanking God for this small, but super significant physical triumph! What areas in your life have you seen triumphs lately?? Do you follow a workout program? If so, I'd love to hear about it! I love new ideas!